The high seats of my Toyota Rav4 were not lymphedema-friendly. Look for cars that allow your legs to be more parallel to the car floor, lessening gravity’s toll. Seat height. The higher the seat, the steeper the incline of the legs, and the more gravity takes its toll on the lymphatic system. Which vehicles have high seats? SUVs (sports utility vehicles) and trucks. The SUV trend of the last 15 years? Bad for leg lymphedema. Which is why I regretted our car choice of three years ago – the Toyota Rav4. Thankfully, it was a lease. The contract was up this month. At the top of our wish list was a vehicle that would keep my legs more parallel to the car floor. Leg room. There’s a reason I call my stockings my “iron legs”, and it’s not because they make me feel like a superhero. It’s because they are thick, heavy and unyielding. For example, when I bend my leg, the fabric of the stockings pinches behind the knee. It’s not debilitating, just one of the annoying things I’ve learned to tolerate. But I’ve also learned to make things easier on myself when I can. That means looking for a car with ample leg room, so I can stretch out and keep my legs straight. 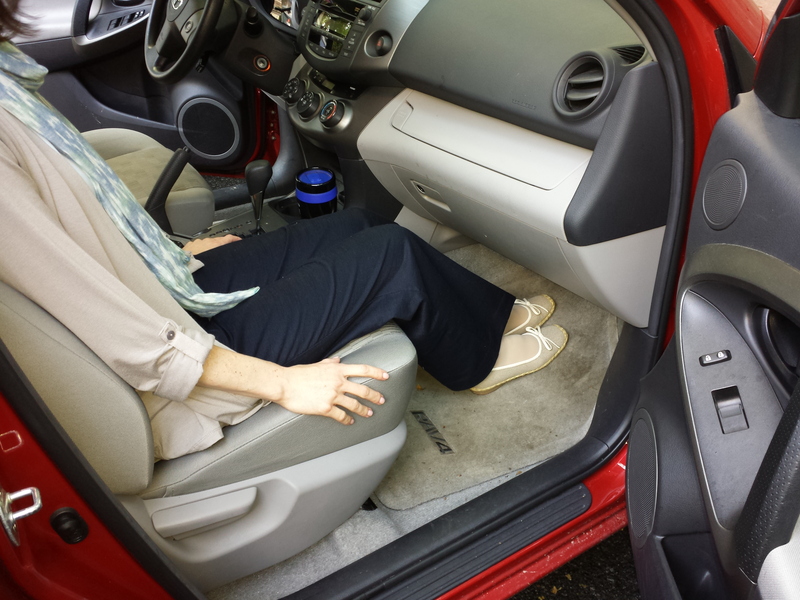 What car did my lymphedema choose? 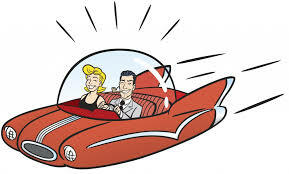 Well, we looked for the 2025 LE Compressionmobile complete with dual leg massage, cooling ankle mist, and electro pulse stimulation every time you hit the brake. But apparently it hasn’t hit the market yet (I can dream). 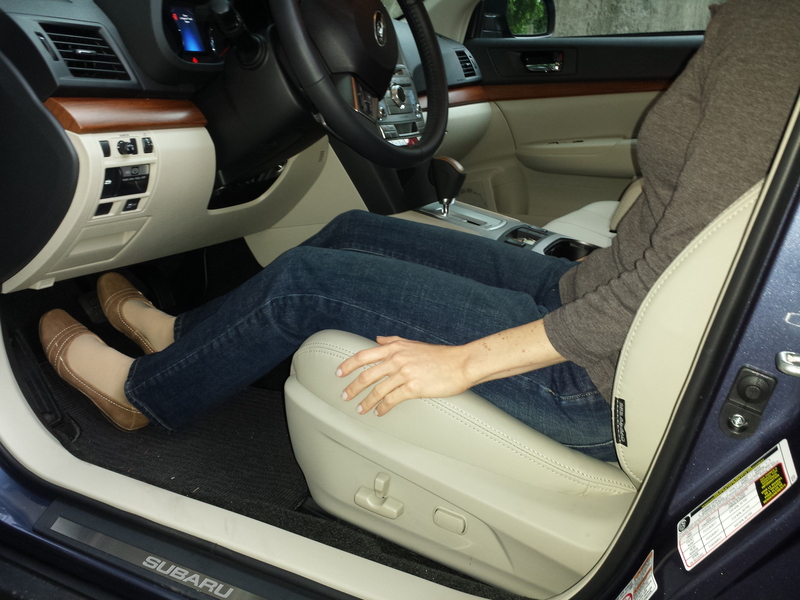 My lymphedema, Luke and me happily settled on the 2014 Subaru Outback. A station wagon by design, the Outback’s seats are much lower than an SUV’s, allowing my legs to rest more horizontally. Plus, with 43 inches of front leg room and 37.8 inches of rear leg room, the interior is more than spacious enough for my 66 inch frame. What’s best is that the Outback has the qualities of an SUV with all-wheel drive, roof rails and plenty of cargo room. You won’t see me strapping a kayak on the top of my Outback and going camping like in the commercials, but I will be driving more confidently in New York’s harsh winters. The lower seats of the Subaru Outback are much more conducive to healthy lymphatic flow. 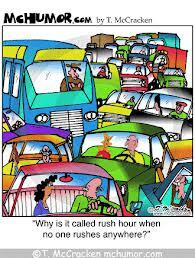 If you are riding comfortably in a station wagon or sedan, stay on course and don’t be tempted by the SUV fad. If you’re like me, and you unwittingly put added pressure on your lymphedema by going with an SUV or truck, keep an eye out down the road for an opportunity to make a change. Your lymphedema will thank you. Disclaimer: Neither I, Luke nor my lymphedema have received compensation from Subaru or any of its subsidiaries. Quite the contrary. We’ll be brown-bagging it for quite some time in the name of lymphatic health, after this car purchase. I always think of my legs like my SIL once said, as cloth doll legs. I have 3 kids and needed a roomy vehicle. I ended up with a mini van. Are those similar to a SUV? I would say yes. Same family. Experiment. Test drive a lower down car to feel the difference-and to get a whif of that new car smell, therapeutic! I love our 2006 “Subee” Outback! It has nearly 100,000 miles on it and still going strong and I’m told it could easily get another 100,000! The earlier models were designed even lower to the ground so it’s a great ride, especially for us lymphies! We also purchased a 2013 Hyundai Sonata and it, too, is low to the ground and has lots of leg room. When in either car and on a long ride (and as a passenger) I rest my leg on something (like a soft bag that has bandages in it) but there is not enough room to put my leg out straight . . .I alternate and elevate my leg on the dashboard . . .also not great. Anyone find a car with even more leg room? So true, Leslie. (And boy, I HOPE I get 200,000) out of this “Subee”! This is the first time I’ve heard someone else talk about the perfect “lymphedema car”! My husband and I take long vacation drives, and not long after my truncal and arm lymphedema diagnosis our road trips became a source of misery. Even short stints in the summer are brutal. I now know to pack my own low sodium food, lots of water, and stop each hour for a 5-10 min walk. But the toughest issue to control is the sun beating on me through the car window. Air conditioning helps, but I can start to swell within a half hour in direct sun. So our strategy was to find a car with air conditioned seats (yes! ), seats with multiple adjustments for comfort, and a powerful front and rear A/C system. A real plus: a back window with a screen that can be lowered and raised. We also purchased two sets of flexible screens with suction cups for the rear side windows. When necessary, I can climb into the back seat and totally avoid the intense rays of the sun. The ability to control hydration, sodium, sun and temperature has allowed me to enjoy traveling again. The lymphedema car of my dreams: a new-to-us Toyota Avalon Limited. By the way, this car has lots of leg room, and the driver seat has a neat control to reduce the depth of leg support. I have short legs and seats in most full-size cars are too long. In contrast, my husband needs the thigh support, and these seats are comfortable for his back. Finding a car for a couple with two different issues was a real task! This is the first time I have seen your blog, and it has been a joy to read. Air conditioned seats?!? Now this is a car I’m going to have to test drive. Thanks for reading and contributing your experience. It is so good to know I am not alone in this! I did not buy an SUV because of the seat height. I couldn’t wait to drive it back to the dealer and get back in my own car! My husband informed the car salesman that I would be very picky during the selection process, and the reason why. I am getting better at explaining it to others when I know they have no way of understanding. I feel that non-lymphies think I’m always overreacting (No one can understand except my husband and mother, and of course, my fellow lymphies). I previously owned a Lincoln Zephyr (would have kept it forever, except it had so many miles on it; it needed to go). The mid-size Zephyr had an awesome tilt seat, allowing me the gap/space necessary to allow circulation at knee bend. I am 5’6″, 130 lbs (when my swelling is down as much as possible). So, if you are larger, the full size, larger seats may work fine for you. However, won’t work for me. My husband owns a Dodge Ram 1500, 3/4 ton. As a passenger, my legs are up, and feet on the dash, or I use something as a prop on the floor. And to drive the truck – well, only if necessary. (Then, I am constantly exercising my legs up and down to try to stay comfortable). All that said, a few years ago, I ended up with a Chevrolet Malibu car, and it works for me. Basically, you need a vehicle with several seat height adjustments and leg room. Believe it or not, the full size Cadillac was not comfortable because the large seat was too long/deep, cutting off circulation at knee bend. Even the depth adjustment was not enough to give me the space I needed. vehicle out there for me other than a car! I would love to hear your comments on waiting room chairs, too. Nancy, I agree – we need to have several seat height options and the seat itself needs to be not too big, not too small, but juuuuust right! Every little bit makes a difference, especially if you have a long commute.